In Texas, large, stuffed baked potatoes may be served as an entree, usually filled with meat, cheese, bacon bits. Larger potatoes around two pounds and 7-8 inches long are used than in other parts of the United States. The meat is often some form of barbecue or smoked meat; in some cases chili is substituted. Vegetables such as broccoli may also be added. As part of the upsurge for healthier fast food, the baked potato has again taken to the streets of the UK both in mobile units and restaurants. 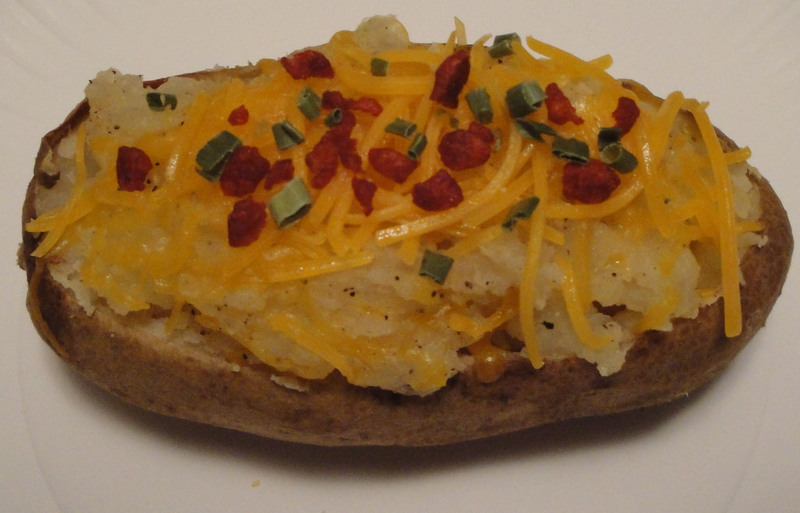 The fast-food chain Spudulike specializes in baked potatoes. This easy cheesy baked potatoes is loaded with good taste. Scrub potatoes and pierce them all over with a fork. Bake until potatoes are tender, about 1 hour. Slice about 1/2 inch off top of each potato and scoop out pulp, leaving the shell. Place the pulp in a bowl, add butter salt, pepper and 1/2 cup cheddar cheese, mash until smooth. Stuff the potato skins with the filling, top with remaining cheese, and place on sheet pan. Return to oven until heated through, about 10 to 15 minutes. Remove the potatoes from the oven, top with bacon bits and chives. Enjoy!